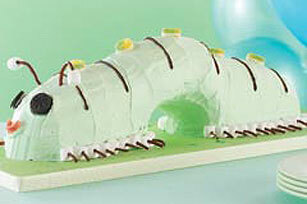 No fancy baking equipment or molds required to make this JELL-O Swirled Caterpillar Cake. Just a plain ol' tube pan and some clever cake cutting. Preheat oven to 350°F. Prepare cake batter as directed on package. Pour three fourths of the batter into greased and floured 10-cup fluted tube pan. Sprinkle dry gelatin mix evenly over batter in pan; cut through batter with knife several times for marble effect, being careful not to cut through to bottom of pan. Top with remaining batter. Bake 45 min. or until toothpick inserted near center comes out clean. Invert pan onto wire rack; cool 5 min. Remove cake from pan; cool completely. Cut out one third of cake. Cut removed cake piece in half; set aside. Stand remaining larger cake piece, cut-ends down, on cake board or tray. Place the smaller cake pieces on each end of large cake piece to resemble a curved caterpillar's body as shown in photo. Tint whipped topping with food coloring; spread onto cake. Drizzle with the melted chocolate to resemble the stripes on a caterpillar's body. Decorate with remaining ingredients as shown in photo. Store in refrigerator. Make sure cake is completely cooled before frosting. A warm cake can cause frosting to soften or melt. Prepare as directed, using your favorite flavor cake mix.